Being Evidence Based in Library and Information Practice will be essential reading for library and information professionals from all sectors who want to make more informed decisions and better meet the needs of their users. The book will also be of interest to students of library and information studies and researchers. Library administrators and assessment librarians will welcome this focus on practice and application of EBLIP in a variety of settings and places. 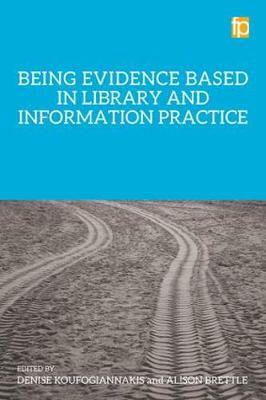 A timely and useful guide, Being Evidence Based in Library and Information Practice demonstrates both the model for Evidence Based Library and Information Practice (EBLIP) and different library settings for development of this ongoing research practice. It is an extremely useful guide for developing evidence-based library improvements and a lifetime of professional growth. The entire book is clearly written, free of jargon (or jargon is explained succinctly), and engaging. Each chapter builds on previous chapters, and the chapters in Part 2 track back appropriately to the explanatory chapters in Part 1. If you are interested in becoming a researcher-practitioner, or in integrating data into your decision-making processes for your library, this book will be quite useful. The book also could be complementary to an introductory textbook on research methods for information professionals looking to grow these skills. It is hard to imagine that more qualified authors exist for this topic than Koufogiannakis and Brettle. Upcoming and new professionals would be wise to read this book, whereas more seasoned professionals are more likely readers and implementers of the concepts presented. How do we make the case that a library tangibly impacts the communities it serves in order to secure funding? How do we maintain, improve, reimagine, or expand a library's services, as appropriate? In Being Evidence Based in Library and Information Practice, editors Denise Koufogiannakis and Alison Brettle make a convincing case that we do so by grounding our professional practice and organizational decision making in evidence...Library administrators will find Being Evidence Based in Library and Information Practice useful for guiding organizational decision making. For library and information science faculty and graduate students, it will be a strong complement to any research methods curriculum. However, this book will resonate most strongly with practitioners who find it rewarding not only to perform the essential work of their library, but also to apply their curiosity and creativity to figuring out how better to do the work. Koufogiannakis and Brettle present an excellent overview of the history and evolution of library evidence-based practice along with the current state of EBLIP. The model they have presented is demonstrated to be usable across the library spectrum. This work is highly recommended.